This Contemporary Ultra Slim designed LED fixture features a series of intensive PAR LEDs to promote Marine and Freshwater growth. All models feature a moisture resistant PC Splash Guard to protect against water mishaps. The durable high output LED bulbs are built to last 40,000+ hours. 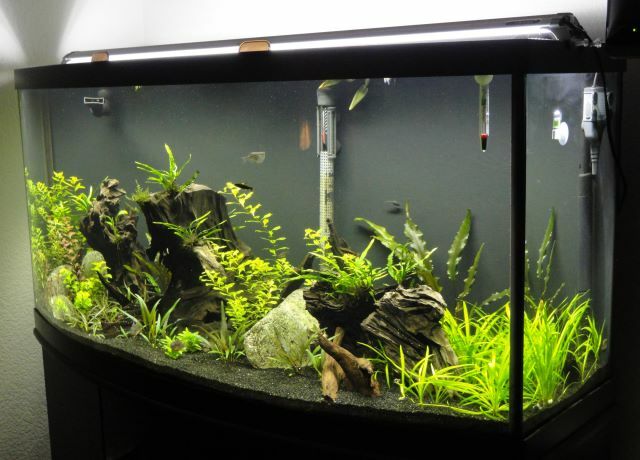 A unique leg fixture allows this LED light to mount on various sized aquariums and sump setups. To extend LED bulb longevity, the circuit boards are built with high quality aluminum and the fixture itself acts as the heat sync to allow ample cooling and superior heat dissipation. 1/10 the power value of standard incandescent lighting and equvilant to three T5 bulbs. The Ray II comes in different lengths as well as Dual High Output LED combinations. Users have the options of a 16", 18", 24", 30", 36" and 48" fixture to meet their aquarium needs. Models are either equipped with a Dual 7,000k LED combo, 10,000k + Actinic combo or Dual 450~465nm High Intensive LED strips. This Contemporary Ultra Slim designed LED fixture features a series of intensive PAR LEDs to promote Marine and Freshwater growth. All models feature a moisture resistant PC Splash Guard to protect against water mishaps. The durable high output LED bulbs are built to last 40,000+ hours. A unique leg fixture allows this LED light to mount on various sized aquariums and sump setups. To extend LED bulb longevity, the circuit boards are built with high quality aluminum and the fixture itself acts as the heat sync to allow ample cooling and superior heat dissipation. 1/10 the power value of standard incandescent lighting and equivalent to three T5 bulbs. The Ray II comes in different lengths as well as Dual High Output LED combinations. Users have the options of a 16", 18", 24", 30", 36" and 48" fixture to meet their aquarium needs. Models are either equipped with a Dual 7,000k LED combo, 10,000k + Actinic combo or Dual 450~465nm High Intensive LED strips. Top Level Categories for Finnex Ray2 Aquarium LED Daylight, 48-Inch.